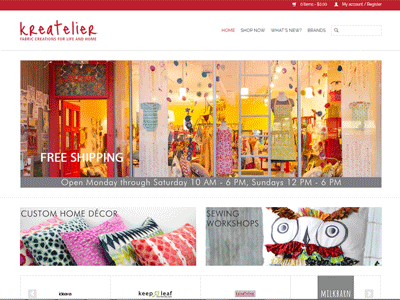 For nearly ten years, the ladies at Kreatelier were happy with the original online store we set up. Fortunately for them, they kept growing, and grew right out of their site. They needed a new solution. Line, the owner of Kreatelier, already used Lightspeed Retail® to control her in-house inventory, and was considering implementing their online tool, eCom. Together, we identified their needs and researched whether this tool would fit – and it did! Their current product selection was imported directly into the new platform, and we customized the otherwise bland template available to match their branding and highlight their home decor and sewing workshops. “Thank you so much Casey. I’m happy you could [figure it out] it because it drove me crazy!